» Die deutsche Version gibt es hier. 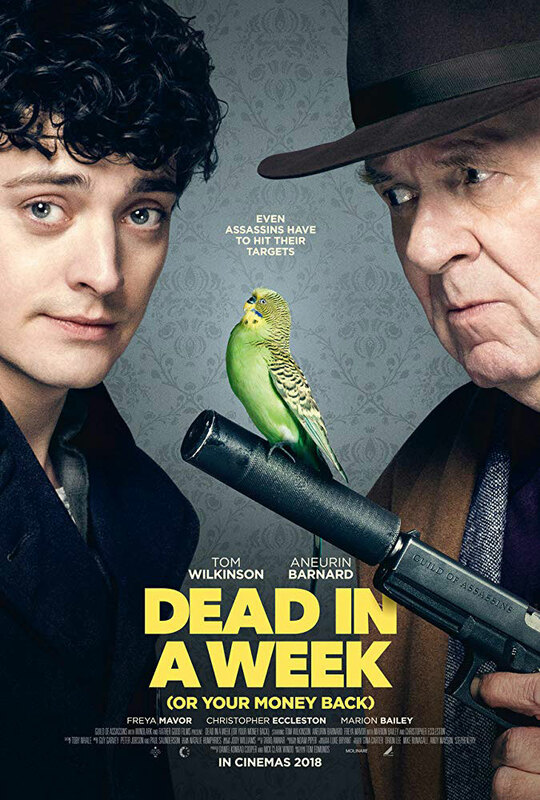 With his feature film debut DEAD IN A WEEK, writer and director Tom Edmunds delivers a little masterpiece, which convinces with an absurd story and on point dialogues. In June 2018 I visited the International Film Festival Emden-Norderney for the first time, because it has a focus on new british and irish cinema. DEAD IN A WEEK (OR YOUR MONEY BACK), which caught my attention just after the announcement of the program, was shown exactly in this strand. Tom Edmunds, who directed the film and wrote the screenplay as well, has an incredibly good feeling for comedy. The bizarre story never gets boring and surprises with clever ideas. To let Leslie’s wife take part in the Southern Counties annual craft fair (Needlepoint category) as a counterpart to the contract killer is terrific. By the way, it is his wife’s fault that DEAD IN A WEEK (OR YOUR MONEY BACK) comes around with a rather unusual soundtrack. When was the last time we heard Tiffany’s „I Think We’re Alone Now“ in a movie? Correct! While Edmunds wrote the screenplay, his wife in the next room listened to the music of the 1980’s. Of course, something like that finds it’s way into the story. And Guy Garvey, lead singer of the band Elbow, is responsible for the rest of the soundtrack. For the title song „Come On Through“, written by him, he renounced to sing it and left it to the up and coming singer-songwriter Isaac Gracie. Another notable point with DEAD IN A WEEK (OR YOUR MONEY BACK) is the almost perfect balance between humor and death, somtehing only a few films succeed in. In an interview with nochnfilm.de, Tom Edmunds has revealed that he basically only kills those characters in the movie, that the audience also wants to see dead. So there is a (bad) character in the movie that is being built up very largely, but then gets killed shortly after its appearance. The audience of the world premiere at the film festival Emden-Norderney welcomed this with frenetic laughter and applause. Unfortunately, DEAD IN A WEEK (OR YOUR MONEY BACK) will only be released on DVD and Blu-Ray in Germany. Due to the great success in Emden and at the Edinburgh International Film Festival, where the film was also shown, maybe there is still hope, that the German distributor will decide to do a theatrical release. After all, the film is way better than everything we get to see as comedy in the german movie theaters. This movie definitely earned the big screen. At the International Filmfest Emden-Norderney I sat down with writer/director Tom Edmund to talk about DEAD IN A WEEK (OR YOUR MONEY BACK). Please excuse the bad audio.